Today, I received an email from my friend to join the "I Love Malaysia" campaign. So I give it a try and hope that I can win something. ^-^ Anyway, the campaign is very easy to join. Just click on the "I LOVE MALAYSIA 52nd Merdeka" logo on my top right hand corner of my blog. Fill in the details and it just took you few seconds to finish it. Then remember to quote my email address which is behkc88@gmail.com under Referrers Email. I would like to wish every one good luck and all the best. And please share with me the good news when you win the contest ok. In this campaign, you are able to win iPhone 3GS worth RM 2500 each. And that's not all as when you refer someone to join this campaign, and if they win, you as the referrer will also win the exact same prize! Very tempting ya....... Come on, join the fun! Would you like to have some "halal" foods with your Malay colleagues and friends? Whenever we have some Malay friends/colleagues, we always have some difficulty when choosing a venue as we have to choose place that is "Halal". And recently, I found a shop that is certified "Halal" in this restaurant which serve Chinese/Vietnamese and Thai Cuisine. Location: No. 8-10 Lebuh Nipah 5, 11900, Penang. It is located at the back row of Hai Nan Homecook Chinese Restaurant. We are the first customer for the dinner session and we were directed to our seats. Then came the menu. They have quite lots of things to order from the menu. But since this is our first time there, we stick to some of the ordinary orders and some recommendation by the restaurant. Actually hubby wants to try the kerabu fish but i insisted that he ordered the kerabu chicken as my gal would like to have some chicken. The chicken is deep fried and garnish with kerabu and sauce. The kerabu chicken is pretty normal that you can find in many places. And since hubby don't take deep fried foods so often, so my gal and I finished most by ourselves. Hubby and my gal love this dish very much. Perhaps this is also the first dishes being served, and they ate most of them but they reckon some part of the stir fry french beans is salty. But it is ok to go with rice. You can check out 忻忻妈咪 blog for this restaurant review. This is my gal ordered and she told me that the wantan noodles are nice and she enjoyed her plate of wantan mee. Hubby orders another plate of CCF as he still feels hungry after his spaghetti. I managed to try some of the CCF and overall, it's not bad but we feel that it is a bit salty for our liking. Hubby went around and saw a western food stall selling spaghetti. So he went and order spaghetti for himself. The outlook of the spaghetti is ok. And dash with lots of parmesan cheese. Well, my gal told me that she can smell that cheese from a far distance. (As my gal don't like parmesan cheese aroma) Hubby asked me to have a try. And I try it and I don't like the spaghetti that they used. I am not sure what brand of spaghetti that they used. I don't really like the textures. There are still lot of stalls to try. And the nasi kandar seems serve delicious foods too! We dine in Yi Garden Cafe several times but we never try the chu char before. So we decided to give the chu char stall a try!!! The Teo Chew steam is not bad. But also nothing to shout about as it is quite a normal dishes that you can find in many places. And the Teo Chew steam is more towards sourness. If you love sourness in your steam fish, then you can give this a try. The fish is fresh and nice. Jalan Tun Dr. Awang, 11900 Bayan Lepas, Penang. This is the sauce that goes with the Roast Duck. Combo 4 - Roast Pork, Char Siew, Roast Chicken and Pak Cham Kai. Their kai lan is blanch and top with oyster sauce and lots of pepper. That's what we order for our dinner. For the environment vice, it is very comfortable with air condition and very clean. When the Mee Sua arrived, both hubby and I both reckon that the mee sua must be very soft judge by the look. As we don't really enjoy the noodles textures being over cooked. So as usual, captured some photo of the foods and hubby starts to dig in. And he told me that the mee sua textures is ok. This bowl of duck drumstick mee sua is mine as hubby had the pork spare ribs and stomach mee sua. My bowl of mee sua tastes nice and the textures of the mee sua suits my taste buds. Once we parked our car nearby the stall, we already smell the herbal aroma came from this stall. And the soup base are full of herbal aroma and the duck drumstick is very tender. Look at the skin of the chai koay. It looks nice right? Well, both the chai koay taste nice. I am very particular with "oh kuih" as most of the place you get you cannot get the textured of the yam. And nowadays, most of the people nicely blend it. But I still prefer my "oh kuih" have some cube yam in there. And this stall "oh kuih" have few yam cube in there. The tastes vice is not bad. But he make a good move though. 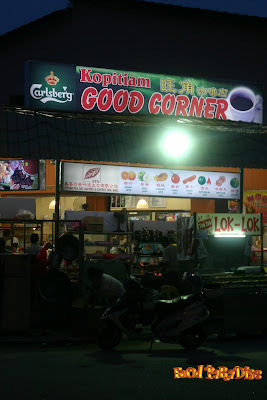 As if he did not check it out this stall, we will not savour this nice aroma and tasty nasi lemak. The sambal uses were so tasty and the rice has a great aroma that hubby thought of "take away" for our gal. But after much discussion, we did not bought her that as we worried by the time she come home from school, the nasi lemak might be spoilt. After school, hubby told her that we went to have a nice aroma and did not take away for her as we scare that it spoilt and she kept complaining that we always go to have some nice foods while she is busy schooling. lol We promised her to bring her there to try one day.